Page:446) The Son of John Hailsworth Pagdin and Lena Brooksbank who married in the December Qtr. 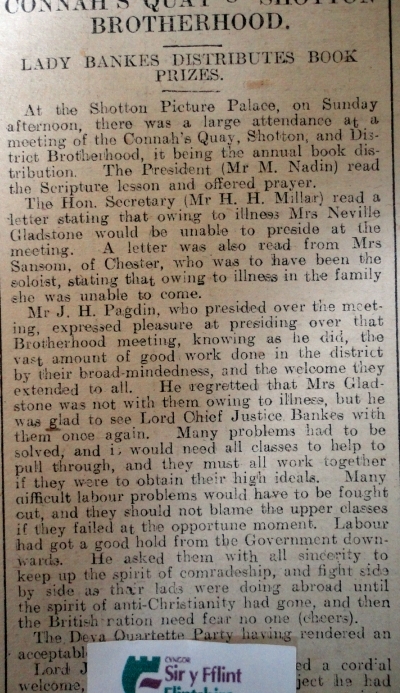 Of 1897 ( Volume 8d Page 789) at Ashton. The 1901 census saw them living at Chester Road, Shotton, Flintshire. Head of the household was John, 31, a Foreman (Galvanized Iron Packing ), who had been born in Stalybridge Cheshire. His wife Lena, 30 was born in Ashton U Lyne Lancashire. Their son Jabez G. Pagdin ( named after John’s father) was 2 and had been born in Hawarden. 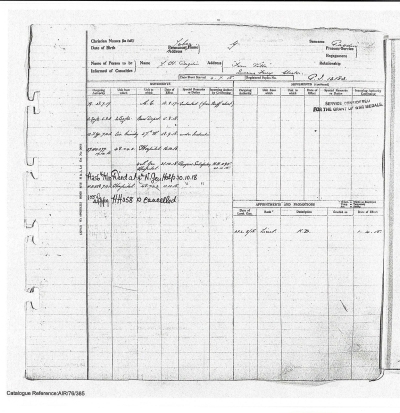 In 1911, the census shows us that the family had moved to Fern Cottage in Queensferry, Flintshire. John Hallsworth 41 was a Galvanizing Works Manager. 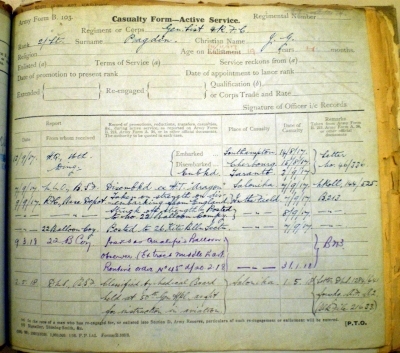 His wife of 13 years, Lena, 40 was recorded on this census as having been born in Hurst Lancashire. 2 children had been born to them, and were still living. Jabez Gilbert was12 and Edith Mary, 8. They were both at school and both had been born in Shotton. Jabez attended Hawarden County School please click on the link to read his entry. 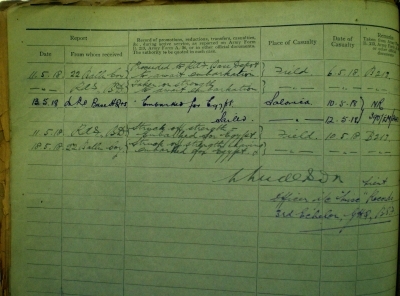 There is an index card for Jabez in The Flintshire Roll of Honour at The County Record Office in Hawarden. ( F19 Queensferry). 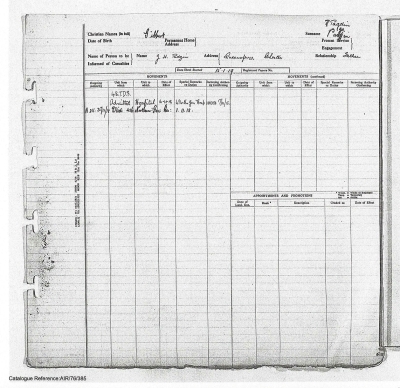 It tells us that Jabez joined the RAF as a 2nd Lietenant in the Kite Balloon Service ( http://www.firstworldwar.com/diaries/inakiteballoon.htm ) and was promoted to 1st Lieutenant in Aeroplanes. He served in Salonika & Egypt. 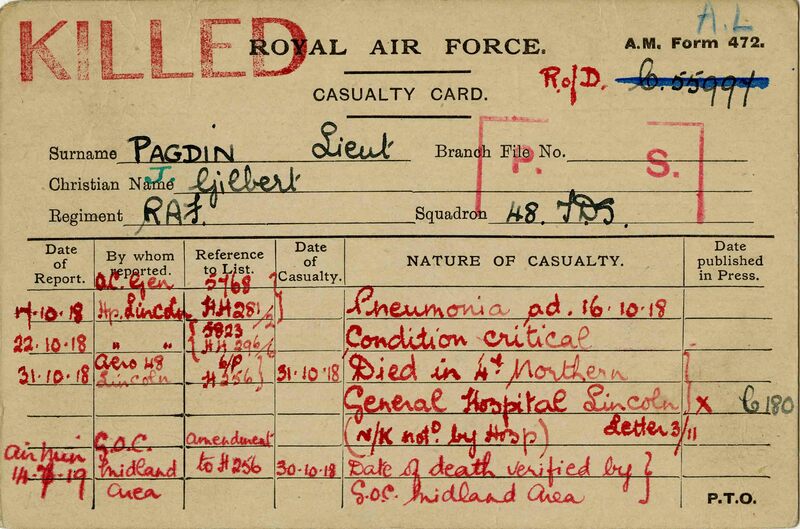 Jabez died in 4th Northern Military Hospital in Lincoln on the 30th October 1918 from pneumonia. His period of service was 2 years. The card was signed by his father John H Pagdin. Jabez was buried in the family grave in St Deniol’s Churchyard, Hawarden. Jabez Gilbert Pagdin, Lieut. Royal Air Service. Only Son of John H. & Lena Pagdin of Queensferry. After service in Salonica & Egypt aged 20. “For King & Country”. “From School to War then to thy perfect peace O Lord”. (St. Deniol’s Churchyard -Monumental Inscriptions. Lovelock ( Page 134) wrote ‘ Fern Villa’, Queensferry. Died, Lincoln of Influenza. Jabez left a will England & Wales, National Probate Calendar (Index of Wills and Administrations). 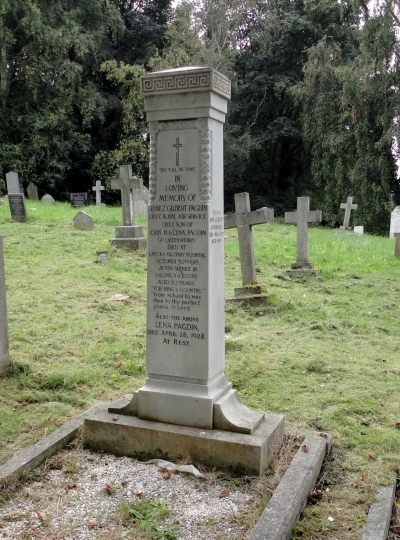 Pagdin, Jabez Gilbert of Fern Villa, Queensferry, Flintshire second-lieutenant in His Majesty’s Royal Air Force died 30th October 1918 at Brighton on Active Military Service. Administration St. Asaph 10th May to John Hailsworth Pagdin Works Manager. Effects £150 17s 10d. Death Place: Flintshire, Registry: St. Asaph. 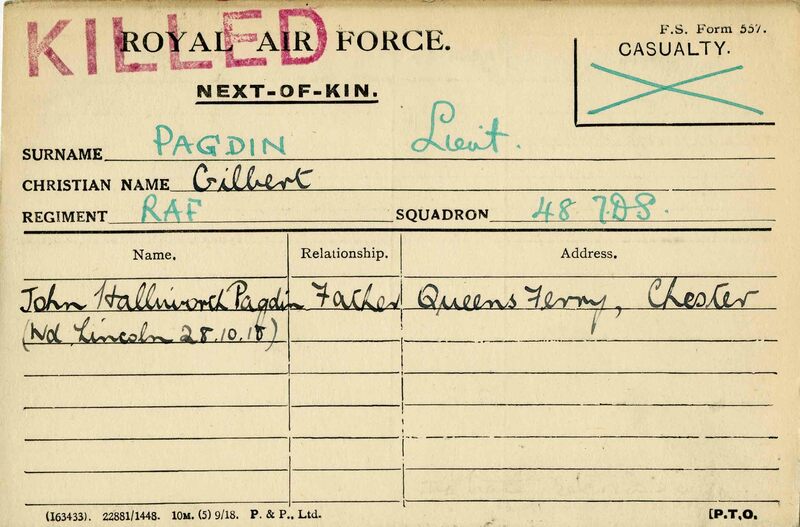 The transcribed cards below and other documents that the RAF Museum sent me, can be emailed to anyone who wants to see them. They are his Service Records and there is a bit of confusion about the date of death as it is 3 different dates according to the papers. Jabez died at home (meaning in the UK). His death was registered in Lincoln. 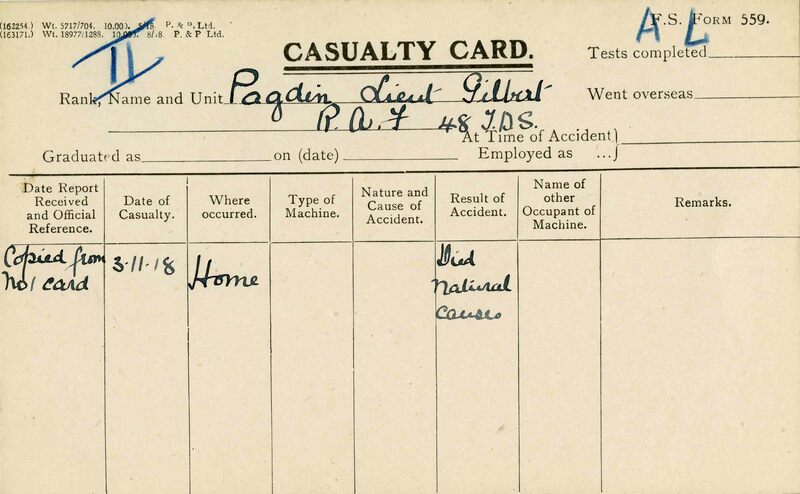 Reference to list:- Amendment to H256 Date of Casualty:- 30th October 1918 Nature:- Date of death verified by G.O.C. Midland Area. Date report received and Official Reference:- Copied from No. 1 card. Result of accident:- Died Natural cause. Name:- John Halliworth(sic) Pagdin (Wd.? Lincoln 28th October 1918), Father, Queensferry, Chester. Jabez’s Service Records, I have the National Archives copy, which I can send if you would like to see it all, although some pages blank. If you would like the rest of the article, but Mr. Pagdin is not mentioned, please get in touch with the website. 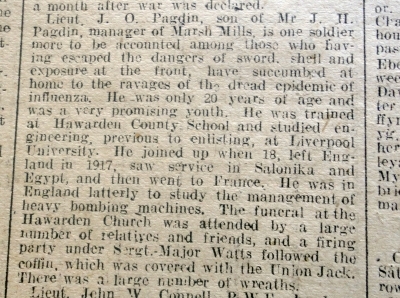 Jabez is also remembered on the Hawarden County Grammar School’s Roll of Honour. and St. Ethelwold’s Roll of Honour. Jabez Gilbert’s Father John Hallsworth Pagdin was named in the Masonic Hall, Hawarden as being a Worshipful Master (Deeside Lodge) in 1925.